To add a video file (such as an MOV or MP4) from your Mac’s hard drive, drag the file to the iTunes window, drag the file to the iTunes Dock icon, or choose File →Add to Library (⌘+O) and choose the file in the Open File dialog. In all cases, the file is added to your iTunes Movie library. Select Movie or TV from the Category drop-down menu and then click the iTunes Store tab. Either click a link on the content pane or type a movie title, music-video name, actor or director name, or other keyword or phrase in the Search field; then press Return to start the search. When you find a video item that interests you, double-click it to see a preview or click the Buy button to purchase the episode or video. Speaking of movies, don’t forget to check out Sierra’s new picture-in-picture option. It works with most video content stored in iTunes, as well as videos on many websites. Just look for the little picture-in-picture icon at the bottom of the video player and click it to make your video float above all other pictures. If you don’t see a picture-in-picture icon on a video player, try right- or Control-clicking the video. If it supports picture-in-picture, you’ll see it in the pop-up menu. 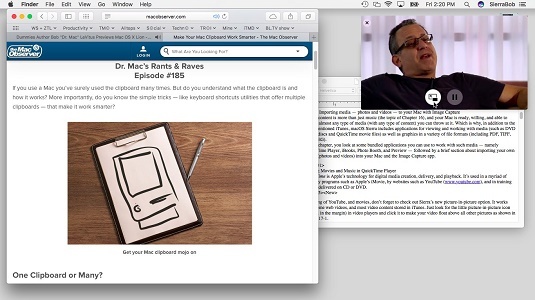 The picture-in-picture video (upper right) continues to play and remains in front of TextEdit (lower right) or Safari (left), even if you’re using them.